Spanish Workshops | Teachers Act Up! Cost: $250; Send 10 or more from your school and receive a discounted registration fee of $225 per person. Registration Deadline – date to be announced. Previously offered December 2, 2011! Don’t change a thing—the workshop was super. I loved how warm and friendly the three facilitators were. LOVED it! I enjoyed all the different activities—the day flew by! I enjoyed it very much! Lots of valuable information! It was so valuable to be encouraged to use español in an authentic restaurant experience. The food was yummy! It was so different from what I expected! This workshop goes beyond Spanish-only insight. I can connect my learning to other cultures too! I would have to say every aspect of the workshop was helpful. The teachers were so energetic! Una Buena presentación—tres mujeres inteligentes y bonitas. ¡Me encantó! ¡Bravo! Now I have a different perspective and understand how my students come in confused and lost. Learning Spanish language and culture opened up my eyes! All that we learned is so useful because I can use it immediately at school. I plan to use material from the workshop with my students next week and I feel better now about communicating with parents. 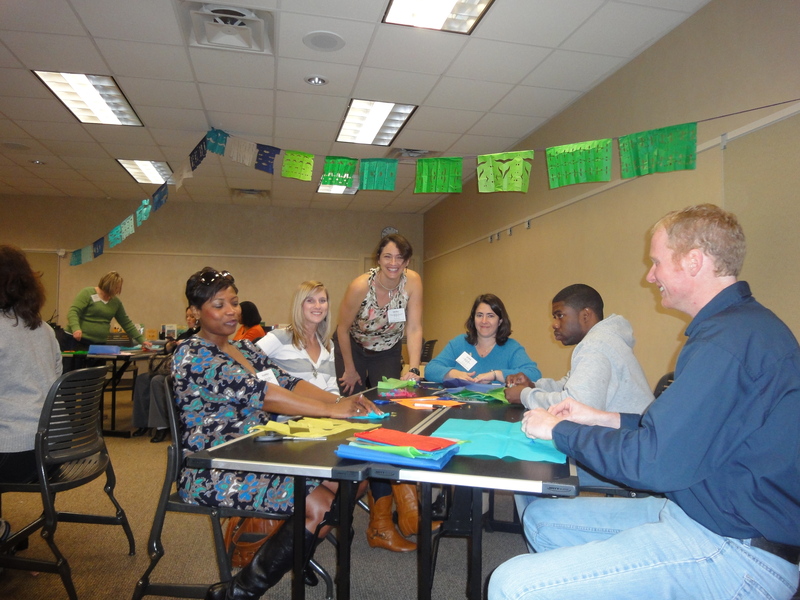 This was an exceptional workshop which provided a variety of strategies for teaching Spanish. The strategies introduced were appropriate and enriching because it included multiple modalities for learning. I take away an understanding of what Hispanic students feel like everyday. Everything was valuable—all the interactive activities and great ideas to integrate Spanish in the classroom. OJO! “Feliz Dias Festivos” should be “Felices Dias Festivos.” All nouns and adjectives should be in agreement in gender and number. Mil Gracias–now I want to hypercorrect and put accents everywhere!!!! What you write is true and important and I corrected my title right away. I hope it will inform a new blog post on mistakes, errors, and a U.S. fear of failure. One can’t be a language learner unless one is willing to make tons of mistakes, ¿verdad que sí? (right?!). More posts coming shortly! I hope we meet in Athens!